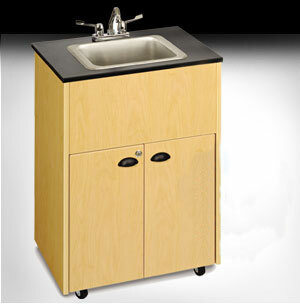 What are the most common troubleshooting issues with a mobile hand washing station and how easy are they to fix on the spot? One of the most common problems in the use of a mobile hand washing station is an electrical problem between the outlet and the unit. This can be because of a tripped breaker, an incorrectly plugged in cord or the need to reset the outlet that is located in the cabinet. More often than not, these issues are simple and easy to fix. To check that the breaker is not tripped plug in a different electrical device to the same outlet and see if it will turn on. If it does not, make sure the station is unplugged and find the breaker box. Turn on the breaker that has clicked off. Return and plug in the station. The reset button is located between the two outlets that are positioned beside the on/off switch in the cabinet of the mobile hand washing station. It is a small button that, if it needs to be reset, will either have no light displayed or a red light. Reset and check the plug to the wall to make sure it is inserted correctly. These simple corrections will also address the problem that caused the mobile hand washing station pump to work and then shut off. If this happens make sure that you are plugged into a dedicated 20A 110V outlet. 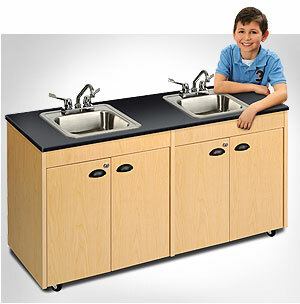 How is an outdoor mobile hand washing station designed to stand up to the elements? Is there anything I can do to extend the life of the cabinet if it is always outside? A mobile hand washing station that is going to be used or stored outdoors also comes with an additional cover. This cover can be placed over the entire unit to prevent any long term exposure to rain, snow or sun. Protecting the surface area from this type of exposure will keep it looking new for years to come. How can I estimate how long a fresh water tank will last? The mobile hand washing station is designed to provide a steady and controlled stream of water that is suitable for hand washing and other uses where water is in short supply. The standard flow of water is ½ gallon per minute, which allows you to estimate how long a standard fresh water tank will last. With a standard fresh water tank of five gallons, that is filled completely, you can estimate that you have enough water for 42 hand washings. This is more than enough for a typical classroom of students per day or for several days in a smaller workplace environment. There is also the option to have additional fresh water tanks on hand so you never have to worry about running out of water.